An AK forms when the skin is badly damaged by ultraviolet (UV) rays from the sun or indoor tanning. Most people get more than one AK. 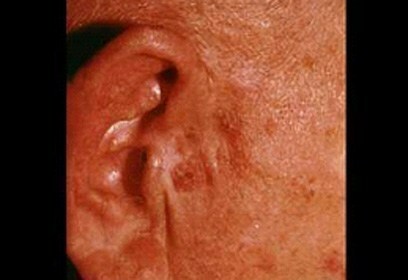 When you have more than one AK, you have actinic keratoses, or AKs. AKs are very common and one of the most frequent reasons for seeing a dermatologist. You often feel an AK before you see it. 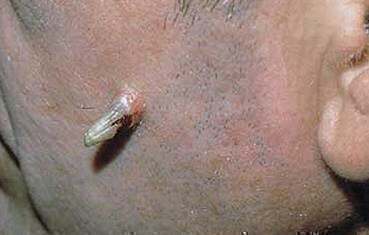 This man felt a sandpaper-like patch on his sun-damaged neck before an AK appeared. Most AKs look like raised, scaly, red bumps on the skin. 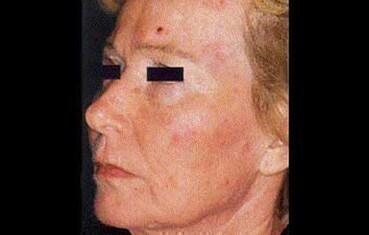 This 57-year-old woman has several AKs on her face. The AKs on this man’s face appear as brown patches. 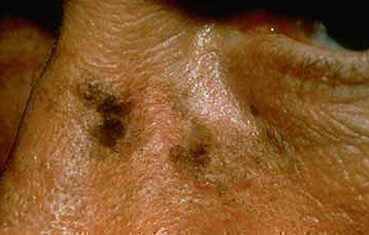 When AKs look like this, they can resemble melanoma, a type of skin cancer. Some AKs grow quickly and look like an animal’s horn. Horns are more likely to progress to skin cancer. Cyrotherapy: Destroys visible AKs by freezing them. The treated skin often blisters and peels off within a few days to a few weeks. This is the most common treatment. 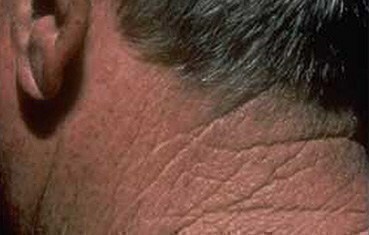 When the skin heals, you may see a small white mark.